(Nanowerk News) In diseases such as multiple sclerosis, cells of the immune system infiltrate the brain tissue, where they cause immense damage. For many years, it was an enigma as to how these cells can escape from the bloodstream. This is no trivial feat, given that specialized blood vessels act as a barrier between the nervous system and the bloodstream. Until now, tissue sections provided the sole evidence that the immune cells really do manage to reach the nerve cells. Now, a team of scientists from the Max Planck Institute of Neurobiology, the University Medical Center Göttingen, and other institutes, has witnessed the movements of these cells "live" under the microscope for the very first time. In the process, they discovered several new behavioural traits of the immune cells. The consolidated findings mark a significant step forward in our understanding of this complex disease ("Effector T cell interactions with meningeal vascular structures in nascent autoimmune CNS lesions"). The brain and the spinal cord monitor and control the functions of all body parts and co-ordinate the whole organism's movements, senses and behaviour. Adequate protection of the brain and spinal cord are therefore of the utmost importance. Physical influences and injuries are warded off by the cranial bone and the vertebral column. Dangers lurking within the body, such as viruses circulating in the bloodstream, are kept at bay by highly specialized blood vessels. The vessels' walls form a barrier that cannot be penetrated by the cells or various other small particles, thus serving to protect the delicate nerve cells. There are, however, exceptions to the rule. 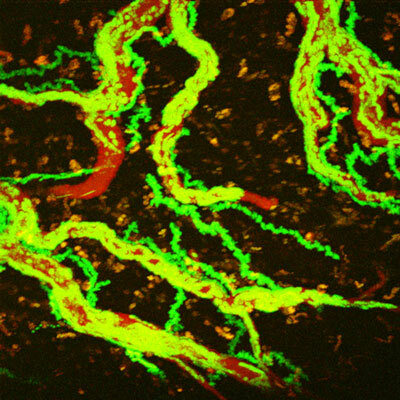 In diseases such as multiple sclerosis (MS), aggressive cells in the immune system manage to break through the blood vessels' barrier. Having invaded the brain tissue, these cells wreak havoc by triggering off inflammatory reactions and attacking nerve cells. In Germany alone, the resulting adverse effects afflict over 120,000 MS-patients. Scientists at the Max Planck Institute of Neurobiology, the University Medical Center Göttingen and their colleagues have now overcome this impossibility. Using a two-photon microscope, the researchers succeeded in tracing the movements of aggressive T-cells labelled with the green fluorescent protein (GFP) in the living tissue of rats. The systematic observation of these cells during the course of the disease provided amazing new insights into the cell's behaviour. The scientists discovered that the aggressive T-cells overcome the barrier between blood and nerve tissue in a number of steps. Outside the nervous system, the labelled cells moved just as we would expect them to; most cells were floating along with the flow of the bloodstream. Only now and again did a cell attach itself briefly onto the vascular wall. Here they rolled in the direction of the blood stream or were being carried off again by the current. Yet, once the cells reached the blood vessels of the nervous system, they began to act in a completely different manner. The scientists observed here far more cells clinging to the vascular walls. "Things got really exciting when we observed that the cells can actually creep, a behaviour so far unheard of for T-cells", Ingo Bartholomäus relates his observations. Here, "creeping" describes an active cell movement, usually against the flow of the bloodstream. The scientists watched T-cells as they took anything between a few minutes and several hours to creep along the vessels' walls. At the end of such a search movement, the cells were either swept away again by the bloodstream or they managed to squeeze through the vascular wall. Having successfully penetrated the blood-brain-barrier, the cells continued their search in the vicinity of the blood vessels. It was thus only a question of time before the T-cells encountered one of the phagocytic cells abundant on the outer linings of blood vessels and on the surface of the nerve tissue. When a mobile T-cell came across such a phagocyte, the two cells formed a closely connected pair. Some of these pairs remained inseparable for several minutes. Although the scientists already knew that T-cells must make contact with phagocytes in order to become immune-activated, they were now able to observe these interactions right where they happened, i.e. at the blood-brain-barrier. And indeed, the T-cells did not launch their attack on the nervous system by releasing their inflammatory neurotransmitters until they had bonded with the phagocytes. As a result of the T-cells' activation, more and more T-cells passed through the vascular walls. "The activation of T-cells at the border to the nerve tissue appears to be a decisive signal for the invasion of the immune cells", concludes Alexander Flügel, supervisor of the study and director of the Department of Experimental and Clinical Neuroimmunology at the University Medical Center Göttingen and Head of the MS Hertie-Institute. Thanks to their sophisticated observation methods, the scientists also established that some of the antibodies already being used in MS-therapy cause the creeping cells to disappear. As Ingo Bartholomäus explains "Up to now, it was only known that these antibodies prevented the T-cells' escaping from the blood vessels, but as our observations now show, they actually prevent them from creeping". Thanks to the scientists' observations, we now have a much clearer picture of how the immune cells move and obtain access to the nervous system. This knowledge is likely to also increase our knowledge of the immune system's security system functions in healthy tissue. However, as is often the case, new insights and information also give rise to many new questions. How do the immune cells manage to cling to the lining of the blood vessels and how do they recognize the weak spots, where they can slip through the barrier between the bloodstream and the nervous system? What governs the cells once they have surmounted the blood-brain-barrier? These are some of the questions the scientists will be addressing next. The long-term goal will be to develop new forms of therapy and medication for multiple sclerosis and other diseases.